Make your own impressive home made jam... it's EASY!!! You don't need a lot of fancy supplies to make home made jams. You need some nice, fresh fruit, such as apricots, peaches, strawberries, red or black raspberries, or blackberries, sugar, and a fruit pectin product (I used Sure Jel). 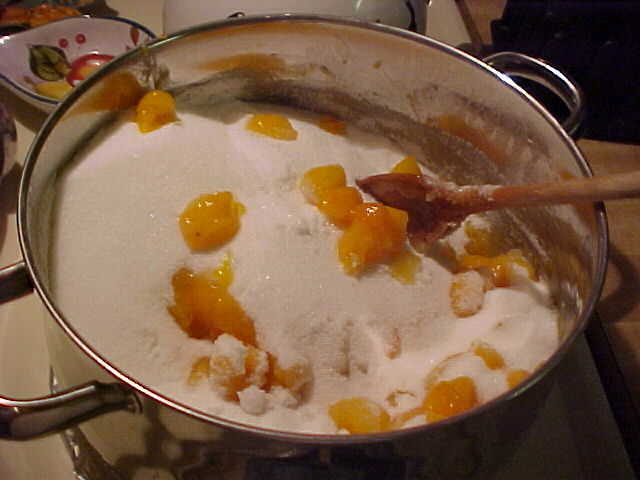 (I'm using apricot in this demonstration). You need 2 big pans, a ladle, pot holders, a pair of tongs, jars with lids and rings, and a damp clean cloth. In the case of the apricot jam shown here, I needed one packet of Sure Jel, the juice of 2 lemons (1/4 C.), 5 C. of cut up apricots, and 7 C. of sugar. I used 4 oz. jelly jars and this made 12 jars. (I had some left over, but we'll use that here at home in the next week or two). Choose good quality, ripe fruit (but not mushy or overripe). 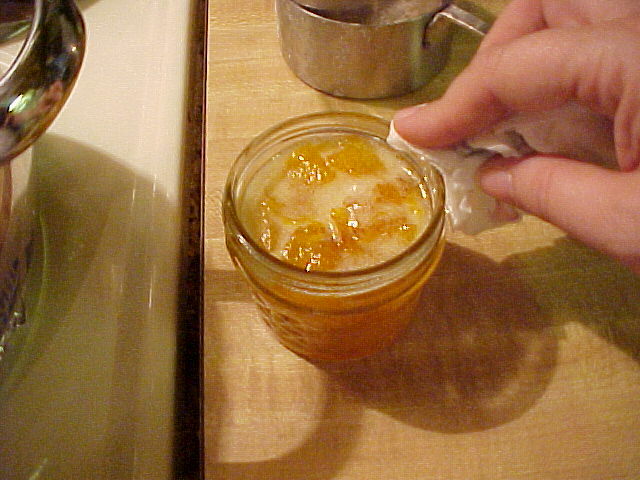 Apricot jam needs lemon juice. 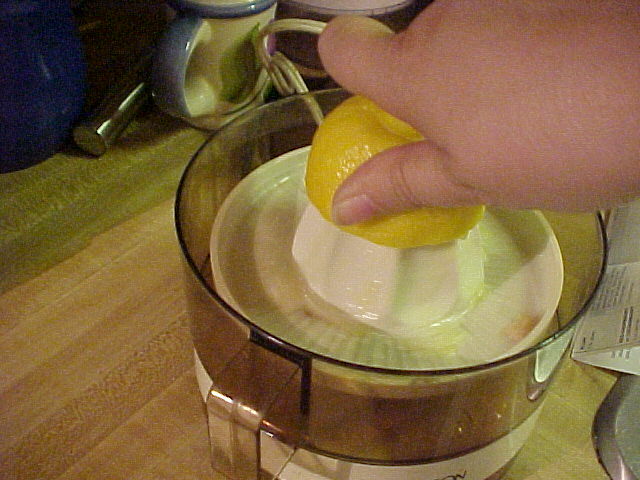 Be sure to roll & "pre-squeeze" to get the most juice from the lemon. 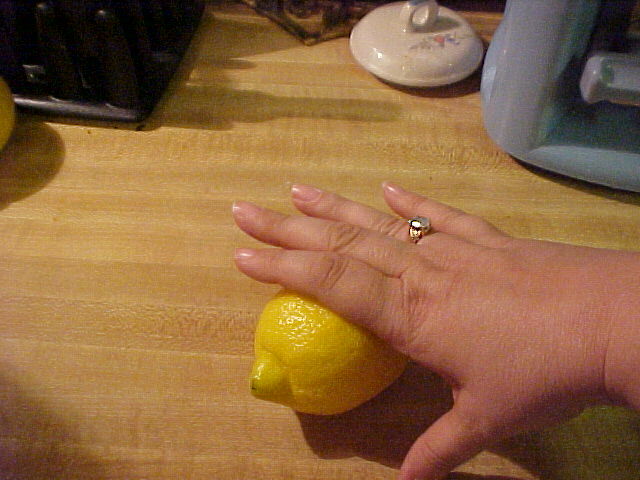 Squeeze your lemons and then measure the juice. Clean and cut up fruit. 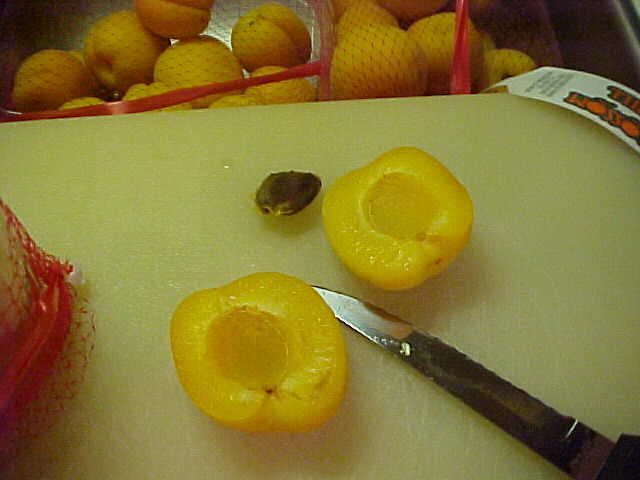 (For apricots, be sure to remove pits). 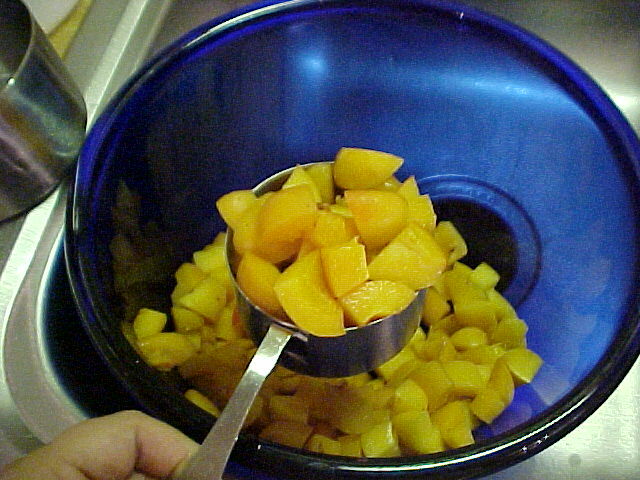 Measure the required amount of cut up fruit (in this case, 5 cups). 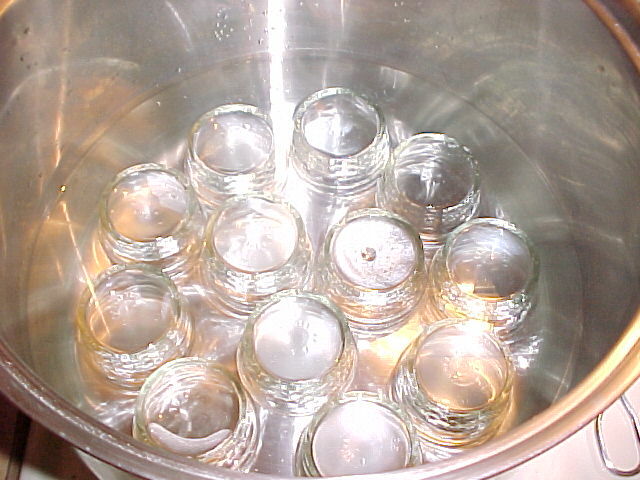 Place your jars face down in a large pot of water and bring to a boil while the jam cooks. 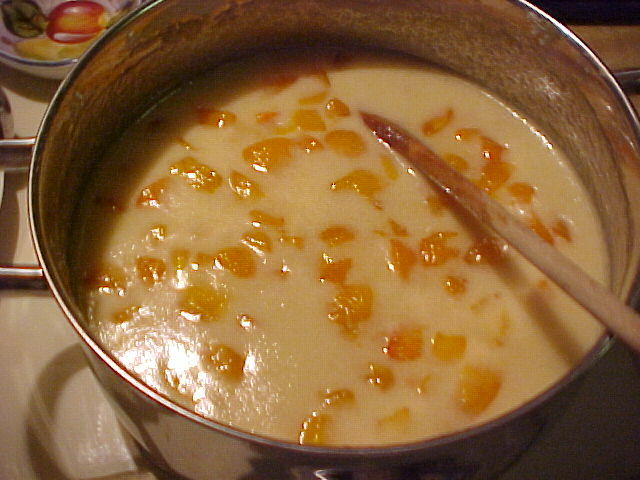 Cook fruit, lemon juice (if needed), and Sure Jel to a rolling boil in a large pan. For those unfamiliar with the term, a "rolling boil" is when it is boiling so hard that stirring it does not make it stop. If you can stir it and have it calm down, then it's not a rolling boil yet. 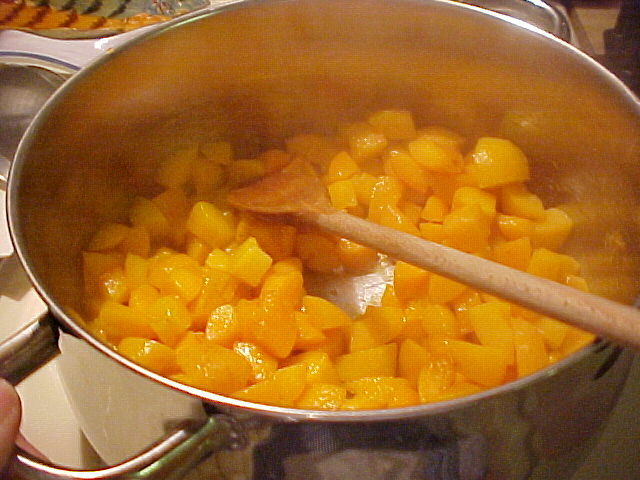 Stir frequently till the jam reaches a rolling boil, then turn off the heat. 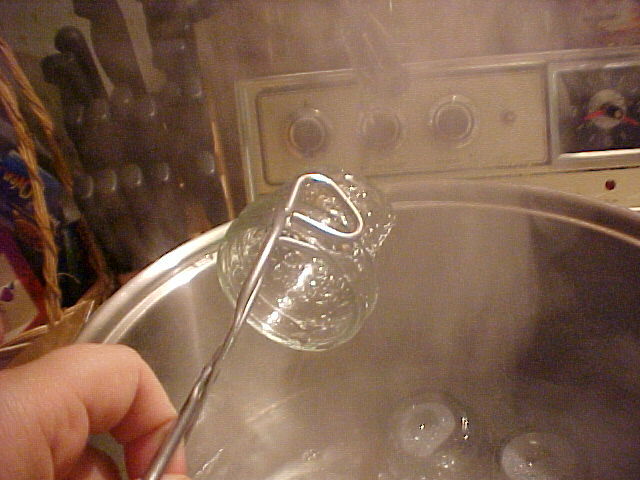 Using your tongs, remove 1 of your jars from the boiling water. Shake excess water off the jar. Ladle the hot jam into your jar (use a wide-mouthed funnel if you have one). Even with the funnel, a little of the jam may be on the rim of the jar, wipe off with a damp cloth. Note: It is critically important that you make sure the rim of the jar is completely clean. Otherwise, the lids will not seal. 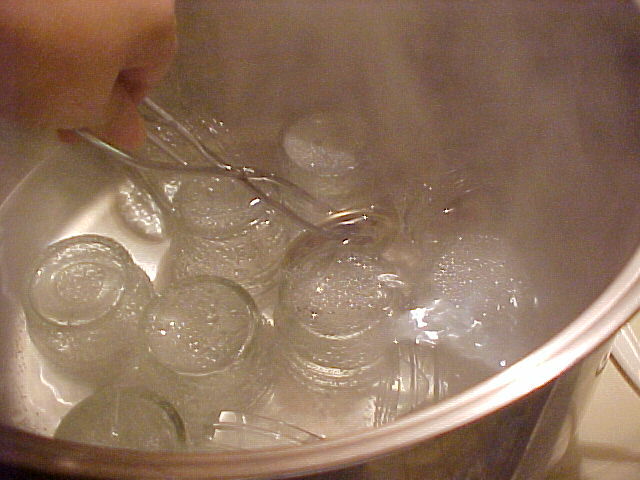 Use your tongs and swirl the lid in the boiling jar water then shake it off & apply to the jar. The jar and the lid will be VERY hot so be sure you use a potholder to hold the jar while you screw the ring on. 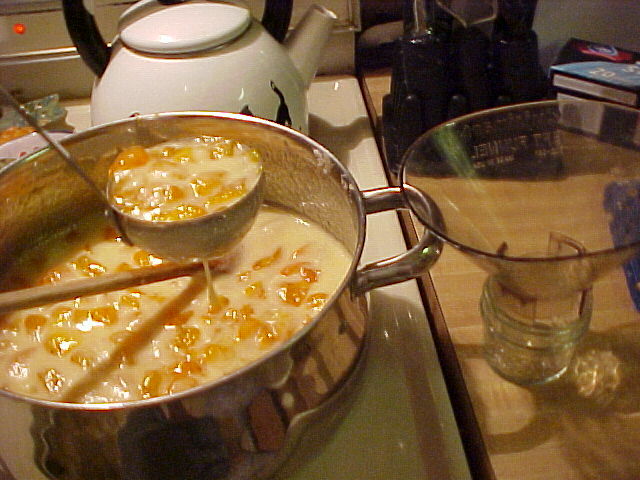 The ring will hold this lid in place and as the jam cools, the lid will POP and seal. You'll hear the jars pop! Here are a dozen 4 oz. 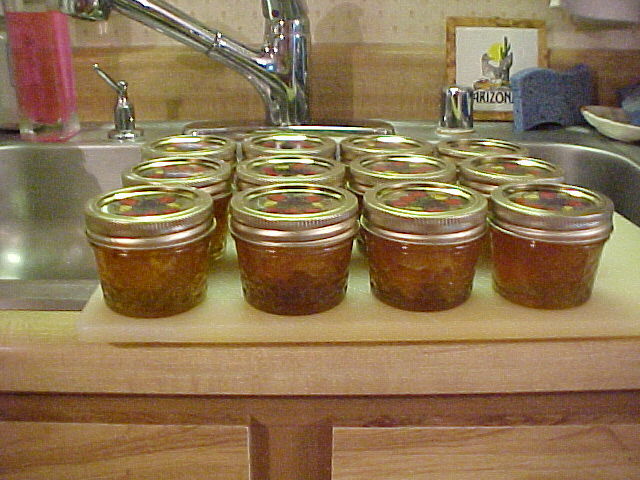 jars of apricot jam! You can use whichever size jam jars you prefer, but I can recommend these little 4 oz. jars. 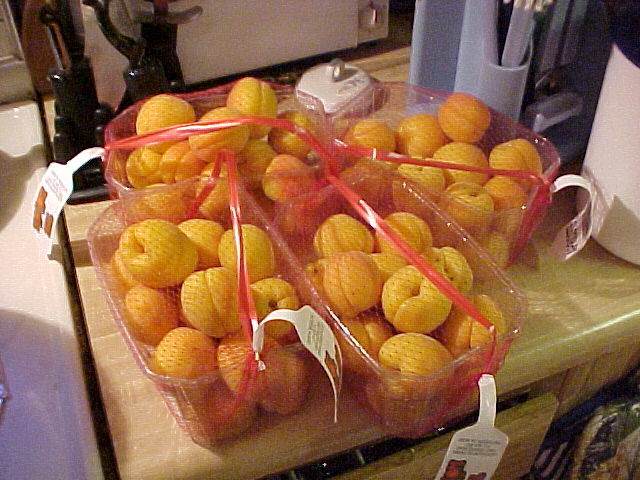 They're just the right size to include in gift baskets and to use as hostess gifts. Next time you need a little gift for someone, just grab one of your little jars of home made jam and really impress them!